Can't you just picture your favorite little girl twirling in an adorable Ruthie Rag Style Dress!? Each finished dress is handmade in our Siloam Springs, Arkansas studio with love and care added into every stitch. The 100% cotton fabric is soft and hangs very nicely. After the dress is stitched, we wash and dry it to create all the ragged and frayed edges that give it such unique character. All the exposed raw edges are securely stitched to prevent additional and unwanted fraying. 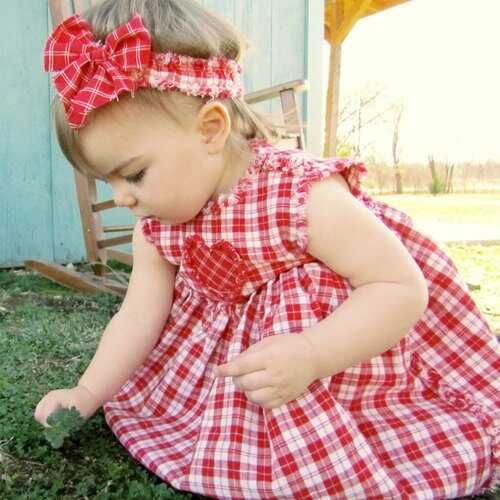 Each Ruthie dress includes a pair of matching bloomers and a soft frayed headband with a bow. These dresses are sized to fit large and look adorable that way. This also allows your little one to continue to wear the dress in a more fitted style as she grows. 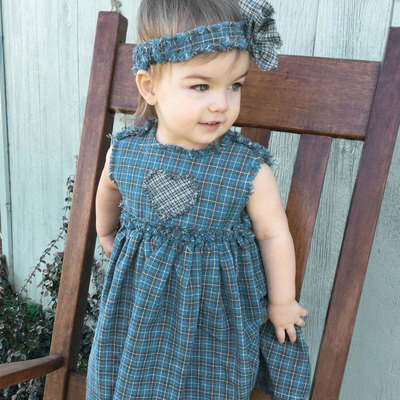 The Ruthie Rag Dress is also sold as a pattern if you want to get creative and choose your own fabrics! This dress would be darling in our new Magnolia Grays. Or use Granny Greens and Cherry Reds to create an adorable Christmas dress for your little girl.